“Tippecanoe and Tyler Too” was the first official presidential campaign slogan. It belonged to William Henry Harrison, and referred to his 1811 battle victory against Tecumseh. But then you get his running mate, John Tyler, thrown in as well, presumably to give it that bouncy trochaic meter. It’s awfully catchy; no wonder Harrison won the election. (If only he’d put equal effort to staying warm during his inaugural speech—the man got sick and died of pneumonia a month later.) It also ushered in the era of synergy between advertising and political campaigns, a state of affairs that has only deepened. 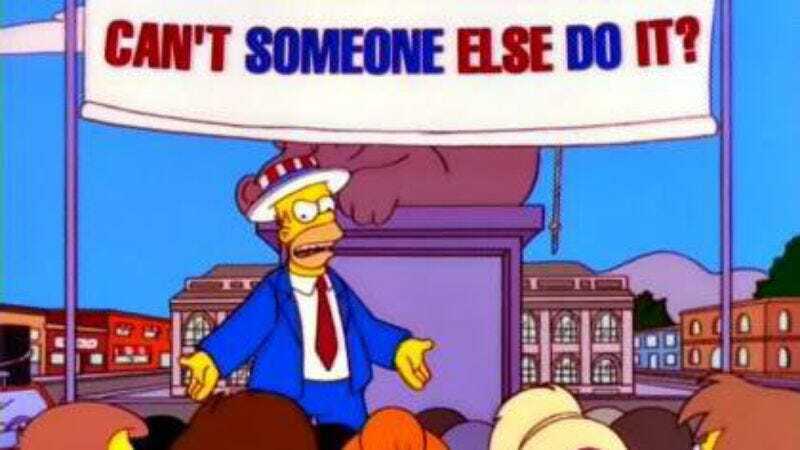 Thereafter, no presidential campaign was complete without its attendant slogan, whether cooked up in the back rooms of campaign offices or rigorously focus-tested into existence, as is more often the case today. But while campaigns are busily rallying supporters on social media, they don’t necessarily consider it to be a place for useful advertising. “It’s a lot more riding the wave than trying to steer the social conversation one way or another,” says Andy Barr, a former political communications director and writer for Politico who now runs the media firm Saguaro Strategies, which focuses on targeted voter outreach. That hashtag is a good example where they’ve tried a lot of things, and in some ways, the market tells you what works. You can test things as much as you want, but eventually, your supporters are just going to take over—whether you’re happy with whatever ends up sticking, it sort of ends up sticking in perpetuity with the campaign. But political hashtags proliferate across social media, the short and pithy nature of the language an ideal way to more effectively sum up a stance or opinion, and even more importantly, have it readily shared and reproducible by others. Facebook is awash in reposted lengthy missives about the enthusiasm Bernie Sanders supporters feel for their candidate; typing #FeelTheBern gets the job done much quicker. Saying that you support those protesting the murder of young black citizens by an overly militarized police force can require an explanation, but the phrase #BlackLivesMatter stands in for a host of politically linked viewpoints, condensed into one rallying cry. And having to offer a different motivational speech every time you want to convey what it means to be strong, fight for what you think is right, and try your best is well and good, but for the rest of us, “Clear eyes, full hearts, can’t lose” gets the job done nicely. In some ways, hashtag slogans are the modern equivalent of sticking a sign in your yard. Rather than planting a “McCain/Palin” sign in your grass for your neighbors to see, you can simply tag your tweet, or Instagram, or Facebook post with your preferred candidate’s succinct phrase. #MakeAmericaGreatAgain is potent, even if it’s awfully long for a hashtag slogan. Its counterpoint, #NeverTrump, wins points for brevity (though if you’re more in the mood to mock the prior hashtag, John Oliver’s #MakeDonaldDrumpfAgain is leading the charge.) It’s the digital equivalent of the old-school tactic of using a sign to show your support. At the end of the day, even with all the ads and other stuff, by far the most effective communication in politics is one-to-one. It’s your neighbor or friend or whoever, whose opinion you respect, talking favorably about that campaign. In a lot of ways, social is sort of providing and steering those individual conversations. And that might be the most consistently undervalued aspect of political campaigns: the sense of community they generate among supporters. It doesn’t take much to create a shared association of people united in common cause. Whereas a yard sign may evoke a remote sense of affinity with someone, a hashtagged post creates opportunities for interaction. People don’t just click “like” or repost; they follow, DM, adapt or quote the source, and build a network that previously required work on the part of the campaign itself. The ease with which folks can put themselves to work online is precisely why skeptics like Malcolm Gladwell spurn its potential for political action and organizing, but that skepticism can’t measure the degree to which new bonds and associations form and endure. Even one new Facebook friend or Twitter follower can help start to build a longer-lasting relationship, as these social media bonds don’t dissolve when the election ends. That sort of easy-to-mock but difficult-to-quantify sorting process is rightly fretted over for its increasing polarization among different groups, but that same polarization generates the very communities most likely to spur one another to increased action or political engagement, however haltingly. Hashtag political slogans are the social media equivalent of the Big Tent politics that define the two major parties. They’re a way to shoehorn into one mold people and groups who actually disagree profoundly about the nature of their party’s policies, its ideological makeup, and the shape of the country. Hashtags take vast swaths of very different voters, and make it seem as though they’re in lockstep. But that conversation among people who qualify as like-minded-enough allows for communication where none might otherwise exist. As Barr states, social media politics is about the supporters, not the campaign. Politics, like most other human endeavors, is largely ruled by emotion. As The New Yorker’s Louis Menand has argued, many of the factors that influence and shape people’s political preferences are about as rational as voting for someone because you’ve had a lot of rain recently. (Sadly, that actually does influence people’s votes.) The social act of voting—namely, the cues you pick up from your neighbors, friends, and environment—dictate most people’s political persuasion far more than any rational calculation of self-interest. And slogans help do that, especially short, memorable ones, popularized in the crucible of collective interactions. #JebCanFixIt was an attempt to impose a slogan onto supporters, and it failed. #BernItDown is more nihilistic, but it gets used consistently thanks to its origins in and relevance to the actual people supporting Sanders. Presidential campaigns, when it comes to social media, need to learn to follow, and save the leading for after they win office.